Morihei Ueshiba known to his students as O’Sensei (great teacher) was the originator of the martial art of Aikido, the way of harmony. O’Sensei was born on 14th December, 1883, in Nisihitani Village, Nichimurou County, Wakayama Prefecture (currently known as Motomachi, Tanabe City). (This biographical outline is taken from the Tanabe City website). He was the only son of a well to do farmer, Yoroku Ueshiba, and his wife, Yuki. He dropped out of middle school and instead entered Yoshida Abacus Academy to study the abacus. He became a tax official using the skill he obtained there. In 1901, new fishery acts were introduced that led to heavy taxation on the local fishermen. Ueshiba set aside his duty and sympathized with the fishermen and participated in strikes with them, which eventually led to his resignation. As a result, with the financial support of his father he moved to Tokyo when he turned eighteen. 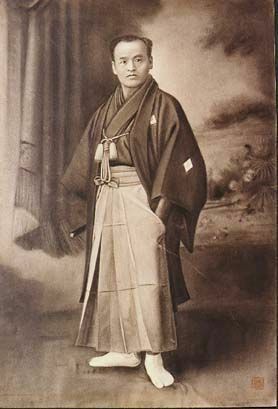 Despite experiencing hardship while living in Tokyo, Ueshiba studied Kitou School of Judo and started training in the Shinkage School of Kendo. However, he had to return home due to his health conditions. After recovering at home, he married his childhood friend Hatsu Itogawa (born in 1881). Ueshiba joined the military under the fourth division of Osaka, 37th regiment and participated in the Russo-Japanese War in 1905. He was recommended to go to military academy due to his outstanding performance. However, he left the army and returned home. He met Kodokan Judo Master Takagi Kiyoshi who visited Tanabe at that time arranged for part of his house to be used as a dojo for Takagi to train him with the local youths. In 1910, Ueshiba gathered 80 local volunteers to form “Kishu Group”, and led them to establish a new settlement in Hokkaido at Kamiyuubetsu Village (currently Shirataki Village, Monbetsu County). The settlement took 2 years due to the harsh conditions, but eventually succeeded. Ueshiba Morihei was thus called “King of Shirataki” by the villagers. While in Hokkaido, he met Sokaku Takeda, master of Daito-ryu Jujutsu and became his student. In 1918, Ueshiba Morihei became a representative of the village. However, he received a telegraph about his father’s critical illness and returned home leaving his position and property behind. On the trip home, Ueshiba heard of a the spiritual leader of Omoto-kyo, Onisaburo Deguchi. He travelled to Ayabe (near Kyoto) to meet him and pray for his father’s recovery. But when he arrived in Tanabe, his father had already passed away. In 1920, Ueshiba moved his entire family to Ayabe to be a follower of Deguchi. He continued his martial arts training and at Deguchi’s support opened a “Ueshiba School” of aiki-bujutsu, the martial art that unites one’s heart, body and spiritual energy. 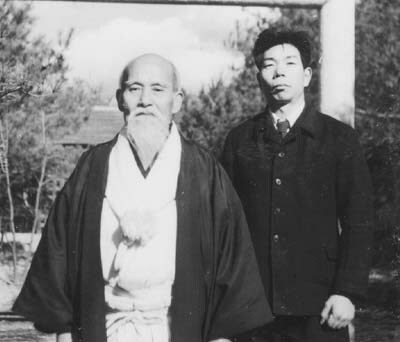 Through Deguch’s influence and contacts, Ueshiba obtained the patronage of high ranking officials such as, Admiral Takeshita, who invited Ueshiba to teach Aiki bujutsu in Tokyo as an instructor for the Marine College and elsewhere. Ueshiba moved to Tokyo and opened a dojo there. When Kano Jigoro, the founder of Koudoukan Judo, visited the dojo, he was impressed by the balanced training of the mind, the body and spiritual energy, remarking, this is the “true budo”. He sent a number of his own students to study with Ueshiba. In April 1931, the Kobukan Dojo in Wakamatsu, Shinjuku Ward was opened (site of the present Aikikai Hombu Dojo). Ueshiba established many other dojos in Tokyo and Osaka, and changed the name of his art to “Aiki Budo”. In 1942, “Aiki Budo” had its final name-change, and finally became “Aikido” as known today. In the same year, Ueshiba moved to the small town of Iwama, in Ibaraki prefecture to pursue his ideals of budo and farming. Over the years that he resided in Iwama he build the Aiki Shrine and the Aiki dojo where he and his wife lived. Iwama became the new centre of Aikido after 1946. In 1948, the Ministry of Education certified the “Aikikai Foundation” and his son Kissamaru moved back to Tokyo to manage the Hombu dojo. However, O’Sensei continued to reside in Iwama and teach Aikido. It is said that it was during this period in Iwama that Ueshiba completed the assimilation of the various budo he had studied into a unified mental, physical and spiritual form we call Aikido. O’Sensei longest serving pupil during this 23 year period, was Morihiro Saito. O’Sensei passed away on 26 April 1969. On his death, the Aikikai Foundation, became the successor and headquarters of the martial tradition established by Morihei Ueshiba. Aikido’s head is referred to as the “Doshu” (the “way leader”). 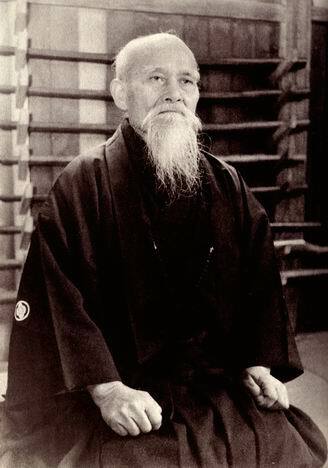 The first “Doshu” was Morihei Ueshiba, followed by his son Kisshomaru (1921-1999), and now it is his grandson, Moriteru Ueshiba (born in 1951) who is the third and current Doshu. However, it was Saito Sensei who succeeded Ueshiba as the head of the Ibaraki dojo and as custodian of the Aiki Shrine, a position he held until his death in 2002. Saito Sensei throughout his life maintained his association with the Aikikai and his faithful teaching of the integrated weapons and body art bequeathed to him by O’Sensei.